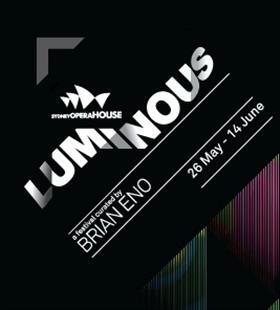 Legendary artist and music producer Brian Eno will be the curator of the inaugural mid-year music festival Luminous at Sydney Opera House. Luminous will feature 30 music acts, performances, light installations and talks across Bennelong Point as part of Vivid Sydney from May 26 to June 14. Looking forward to being 'let loose' on Sydney Opera House, Brian Eno believes the artists in his program all share a single characteristic: they don't fall into any obvious category. "They are people who work in the new territories, the places in between, the places out at the edges," he said. "Some of them take old forms and infuse them with new life, and make them new again, and others have invented forms of art that didn't previously exist." the city into a spectacular living canvas of music and light in and around Sydney Opera House, The Rocks, Circular Quay and city centre. as a major creative hub in the Asia Pacific region and celebrate the diversity of Sydney's creative industries. as part of Smart Light Sydney. Music highlights include New York supergroup Battles, UK synth-popsters Ladytron, electronic whiz Jon Hopkins, the indescribable Reggie Watts and Fourth World composer and musician Jon Hassell. The line up also includes reggae legend Lee 'Scratch' Perry, musical revolutionary Rachid Taha, Irish singer-songwriter Damien Dempsey and the cosmic Laraaji, whilst The Necks join Back to Back Theatre for the intense part-theatre, part-concert Food Court.